The first 8 or 9 years of his pitching career, my son showed real promise. He is now almost 18, a senior, and working toward college ball. He has been training in a DriveLine program for a little over a year. He is passionate about baseball. He is on his third professional pitching coach and recently began ■■■■■■■■■■■■’s 90 MPH workout. When not in school, he is either at the training center or the gym until 9 PM. Over the summer, he broke 80 mph. His top speed so far is 81.7. He has identified lack of separation as his biggest issue. He does better on a flat surface like when he is long tossing, but when he gets on the mound, he continues to open up too soon. He blames muscle memory and years of poor mechanics. No matter how he tries, he can’t seem to translate to the mound staying closed long enough to cultivate the necessary energy transfer. Does anyone know any good exercises to increase torso separation for maximum velocity? Thanks. If your son is working off of something like the above, there’s a definite reason why he’s doing. By “opening up”, as you say, his body’s natural defense mechanism of protecting itself from falling down, or in this case, stepping in a hole, is taking over and making him anticipate this kind of hazard. Think of it, for a moment. Can you visualize the hesitation - thus seeing him do exactly what you mention here. On a flat surface, he has no holes, no slanted surface, nothing that would give him second thoughts. Ask your son if he feels this way. 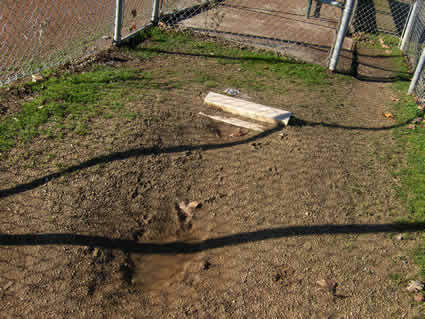 See if possibly pitching off the backside of the mound - facing second base, doesn’t produce better results. Does he have the physical ability to separate? Have you done any baseline testing to establish biomechanical deficiencies that prevent him from doing what he is trying to do? His problem may be muscle confusion rather than muscle memory. He may have a weak muscle group that prevent him from separating. For example, it could be that his gluteus muscles are weak causing his hip flexors to shorten in compensation and preventing his hips and shoulders from separating. If he is training hard and not getting anywhere then he likely isn’t training the muscles that need help and those muscles may be two links away in the chain from the area of focus. TXJIM Would you please explain to mriley, what baseline testing to establish biomechanical deficiencies that prevent him from doing what he is trying to do? I had my son take the fall season off to focus on mobility, agility and stability. He too has a need to separate better. I took him in for a 2D pitching analysis and then took him in for a 3D motion analysis to measure his general movement biomechanics and identify the physical causes of the pitching mechanics issues we identified. We are fortunate to have access to a facility with DARI , http://darimotion.com/solutions/performance/ , and were able to identify his specific physical deficiencies. He spent the last 7 weeks training there to address his hip mobility by first identifying the specific muscle groups that were weak, how he was compensating and then training the correct muscles for various movements. In just 7 weeks he has cut half a second off his pro shuttle and increase his vertical jump and broad jump all while while gaining 7 pounds. These gains are due to improving his strength on the muscles that were causing him to compensate in various movement patterns. It’s easy to say “you need to separate to throw harder”, but if he doesn’t have the mobility to move the way you want is not going to happen. Thanks so much guys. Makes perfect sense. We will look into having him tested. The amount of separation a pitcher can achieve is ultimately limited by his flexibility/mobility. Thus, separation will differ from pitcher to pitcher. There is no right or wrong with this. Pitchers with more girth in their torso will tend not to separate as much as other pitchers. A good example of this is C.C. Sebathia who is obviously a very good pitcher. Poor mechanics can also impact separation. Early shoulder rotation means the shoulders rotate before the hips fully open and that means less than maximum separation. So, any mechanics that leads to early shoulder rotation can impact separation. Such mechanics often include posture and glove issues. The first and foremost thing consider when projecting this chronological age groups velocity potential is actual biological age and genetic make up of their fast twitch to slow twitch muscle types used in their shortening (muscles contracting forwards acceleration) Kinetic chain. If he is an equated biological maturer he falls in the category of average HS varsity velocity. If he is a delayed biological maturer he falls in at higher HS Varsity velocity. If he is an advanced biological maturer he would be considered an adult and performing at lower velocities for HS Varsity. Even 81 is a gain from this program! if he did not participate he would have not attained 80! Stay with Drivelines methods, their preferred mechanics are gleaned from Tim lincecums top half drive (Dr. Marshall approved, before the 2 cy young’s) where the pendulum swing drops down behind the posterior then the Humeral/forearm transition tracking up in a helix rotational lift they call the “spiral stair case”. does he perform this way? By the sounds of it they are old school traditionally oriented coaches who are teaching what they have seen or produced in the past. This history is loaded with well meaning but Kinesiologically and sports physiologically lesser curious. This is the worst kind of marketing ploy and should be eliminated from professional adds and names. Is he competing during the fall and winter? If he is then he is not attaining training regression where real gains occur because of having to be ready and rested. He should not be able to pitch well right now from training output. If he is competing or show casing and is in training regression expect lower Velo now and higher velocity when he comes out of regression and goes on maintenance while adrenaline assisted competition goes on. His highest Velo should be seen at the end of his competitive championship season. Here we go with the traditionally oriented coaches! Hip/shoulder separation is a false flag that does not need to be performed in order to create your highest genetic ball velocity. Hip/shoulder separation is performed (lengthened and shortened) during the “Humeral/forearm transition phase” when the ball and body are finding length and timing in order to then throw later in the chain. I am trying to figure out what exactly is separated in the hip/torso separation. The hips refers to the hip bone. Does the other part refer to both of the shoulders, only the back shoulder, or the back side arm? This is because his mechanics change to the proper timing and footwork, this is what he should bring to the mound. The sooner the better! Pitchers who land closed always display late Humeral/forearm timing that then takes extra movements like “separation” to allow the Humerus to catch up. There is no blame, he is just caught up in the cultural established system that is stuck in anecdotal tradition. Maybe a video here could clear up a few things. There is no energy transfer, all dropping in is lengthening, all Humeral/forearm transition is lengthening. Only when the forwards acceleration phase kicks (ball starts reading forwards progress) in does the contraction from there count towards forwards force application. This is a Kinesiological fact whether well meaning coaches recognize it or not. I would drop this form of thinking and go with this!!! These are immediate Velo gainers. Ask him to grip all fastballs with the index and middle fingers together making one finger. Ask him to stride only the distance he trots foot to foot, so he can then contract against the glove side leg the way rotational torque works. This will produce higher full body rotational speeds with his now postured body axis. Ask him to stay tall and pull against his planted glove side leg and rotate 180 degrees by firming up (extending) his glove side knee. Ask him to recover tall with his elbow popping up not down. Ask him to forearm pronate all pitch types to protect his elbow and gain whip efficiency. Ask your current pitching coach about these things, be prepared for the traditional rebuttal. Don’t be shy if you or others need clarification on anything. to all of the great answers here!!! If you are looking for a great exercise video that is specifically designed to help with your rotation, stability and separation, then check out a youtube video by Premier Fitness Systems. Even though the video is based on the golf swing, the separation movements are very similar to a pitchers separation movements. The trainer will take you through a series of exercises to help your gain mobility and separation. I use this video with my pitchers. Thanks guys for all these good responses. Taking it all in. In the meantime, my son participated in a PitRX training this weekend and got a lot out of it—vector training, mobility assessment, head stabilization, chest to glove, proper rotation, proper arm positioning, speed of wind-up and delivery. No longer rocking back to throw and eliminated his head tilt. Developing a 90-day personalized program with follow up. Saw a 5 mph increase overnight. Will let you know how it goes. I know the **MPH club was bashed, but this last post speaks to all the mechanics espoused in that program as well as what is in Tuff Cuff. You have heard a lot of advice, and seem to be involved in multiple programs, so one must be careful of laying too much credence on any one program. Perhaps this is a culmination of a few things, and perhaps your son was simply able to get past a mental block. There is a lot of talk about separation, but I’d like to give you a little advice: Too much separation can be a BAD THING. Balance in pitching, as in life, is essential and allows the natural flow of each individual athlete to emerge.